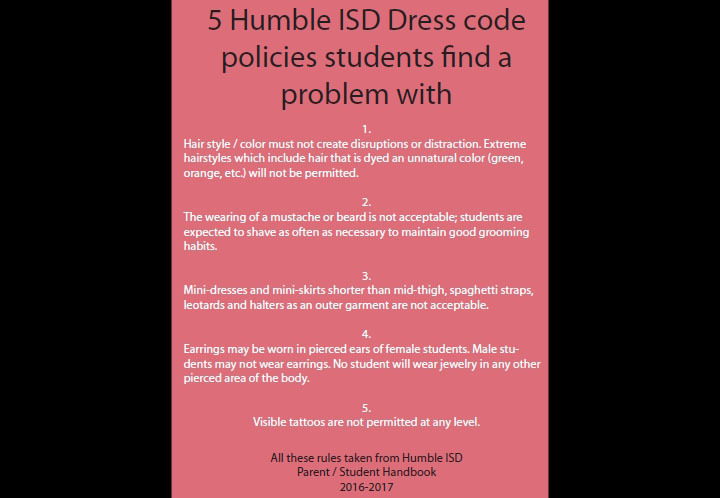 Five of the most commonly cited rules that students say they take issue with in the Humble ISD dress code policy. Dress code, a recurring issue and debate among students, teachers, and administration. What’s allowed, what should be, the fine line between self expression and modesty. This topic having been discussed several different times, on several different occasions, now, there’s hope that there could be changes made. “We’ve heard Fagen has some ideas,” AP Major said. Nothing has been finalized or released yet, when I talked to several of the administrators they were all at a loss of knowledge as the rest of us. Several things have been presented to committee, we however don’t know what that is and neither do the administrators. “We’ll know when the students know,” Assistant principal Mark Ruffin said. Gossip of change spreads through the classrooms. Teachers say there will be change but the source of where the word has come from has yet to be identified. From a source that wishes to remain unknown, dress code repeals have been pitched to committee hoping to take less time out of the school day worrying about what a student’s appearance is.